Do you need Facebook Fans, Facebook Friends and Twitter Followers? Our new ebook tells you how to get over 1000 Facebook fans, Facebook friends and Twitter followers in a very short time without paying anyone to do it! Get 1000+ Facebook fans and Twitter followers on your own in as little as ONE MONTH! Is the social media a passing fad? Is the social media just for kids? Is Social Networking appropriate for all businesses? What if I don't have a website? Can I use the Facebook and Twitter to generate business anyway? How do I get a short Facebook username? What package should I buy if I have more than one site to promote? What package should I buy if I want 1,000 Facebook fans? What package should I buy if I want 5,000 Facebook fans? What package should I buy if I want 10,000 Facebook fans? What package should I buy if I want 100,000 Facebook fans? What package should I buy if I want 1,000 Twitter followers? What package should I buy if I want 5,000 Twitter followers? What package should I buy if I want 10,000 Twitter followers? What package should I buy if I want 100,000 Twitter followers? Is there a limit on the number of Facebook Fans and Twitter Followers I can have? Not likely! As of March 15, 2010, Facebook has over 400 million active users (see http://wiki.answers.com/Q/How_many_users_does_Facebook_have/), and as of March 4, 2010, Twitter has over 75 million users (see http://www.technicstoday.com/2010/03/twitter-users-hit-75-million/). Consider this brilliant video that provides a clear view of the sharp shifts in marketing. The bottom line is always the bottom line: the return on investment (ROI). Sure, kids use it, but so do adults, politicians, celebrities, business owners, and anyone who understands the basic concept of keeping in touch with a large group of individuals such as the average "Joe and Joanne Shmoe". However, teens don't "tweet" as much as adults do, and Facebook demographics are showing a shift in demographics to the age group of 54+. The bottom line is, this isn't just kid stuff. YES! The uSocial.com eBook will show you how. Only $29.99 - Order Now! Facebook requires 25 fans to get a short username. If you don't have 25 fans, you're starting off on the wrong (long name) foot. There's only one package, and you can use it as many times as you like for as many sites as want. Only $29.99 - Order Now! There's only one package, and you can use the same uSocial.com utilities to increase your Facebook fan base to whatever level you need. Learn how to do it yourself for only $29.99 - Order Now! 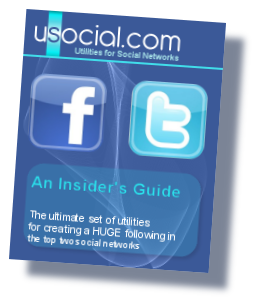 There's only one package, and you can use the same uSocial.com utilities to increase your Twitter followers to whatever level you need. Learn how to do it yourself for only $29.99 - Order Now! © Copyright 2010 uSocial. All right reserved. Sign up for your uSocial.com eBook! The uSocial eBook is the only one of its kind. It's loaded with easy-to-follow, tested examples that any business model can use. It also features indespensible utilities and resources. You'll learn the simple steps to create a massive following, including what to incorporate into your profile, your pictures, and what to write on your wall and in your tweets. You'll learn how to use the major social networking sites to create HUGE followings in ONE month! Sign up right now!